The A-2™ AceClamp® is stronger than most single set-screw clamps. And won't scratch the roof panel when installed. The A-2™ AceClamp® is designed with a grounding cable groove in the body of the clamp specifically for use with racking systems. A stainless steel sleeve and set screw hold the grounding wire in place. No worries about torque back-out. 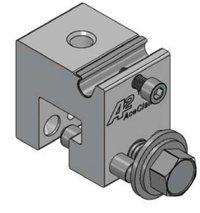 The A-2™ AceClamp® Push-Pin and washer design locks into the clamp to prevent loosening when subjected to seismic or wind flutter vibration loads.